The lake is about 26 miles long and 7 miles widest at its widest point. 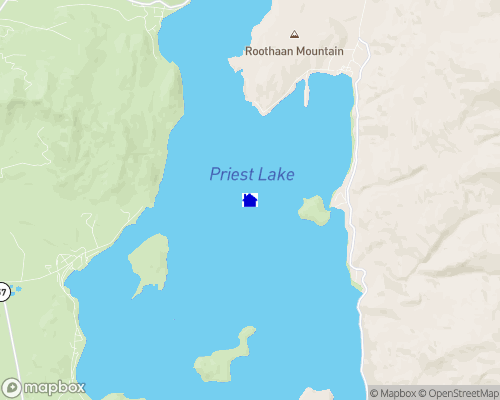 There is a small lake, upper Priest Lake, that is boat accesible through a 4 mile thoroughfare. Jet skis are allowed. The lake is very clean and clear and is very good for swimming and water skiing. Sailing is a popular summer activity. Summer and Winter levels vary about 2 feet. Boat docks are permitted along with Shore Stations and this listing includes a Shore Station that will accommodate a 21' boat. Power boats are permitted and it is very common to see kayaks and canoes. The lake is about 350' at its deepest point. The nearest communities are Spokane, WA and Coeur d'Alene and Sandpoint, ID. Look at Pecky Cox for more info on the lake.